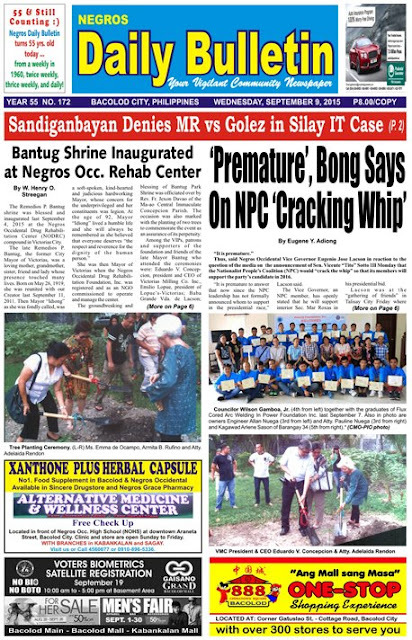 Today the Negros Daily Bulletin (NDB) celebrates its 55th year of existence as a vigilant community newspaper in Region VI - Western Visayas, which started from a weekly issue in 1960, twice weekly, thrice weekly, and finally daily. It is my pride and honor that I am a part and parcel of the struggle and success of this newspaper. I started in 1991 as a news stringer in our place, the small city of La Carlota, and later wrote a column under the name "Vibrations". For 24 years in keeping myself vibrating of what's come into my mind, I learn, appreciate, and feel proud of the camaraderie, fellowship of the staff, writers, news reporters, and the leadership of a humble, soft-spoken editor in chief, Ruperto "Pert" Toga. I also take pride that I was one of those 12 first corporate officers when NDB got its legal corporate entity as Negros Bulletin Publication, Inc. on September 19, 1995. I would like to share it to you from the prolific pen of its editor in chief, Pert Toga as he recollects it, the NDB early days. 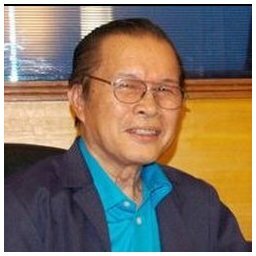 It’s our 55th anniversary in September, 2015, considering that Negros Bulletin started hitting the streets as a weekly paper, way back in 1960, at a time when the streets of Bacolod were still a picture of complete serenity, order and discipline, comparatively speaking, to today’s chaotic and almost topsy turvy state, a sign of prosperity, they say, notably in the busiest sections of the downtown area during peak hours. They insist this could be an indication of progress and development of a fast-growing city. Bacolod in the ’60s was already showing clear signs of progress and development, which was, at the time only on its 22nd year as a chartered city, but already humming with economic activities, an indication of greater things to come. At the time, horse-drawn calesas were still very much part of the city’s traffic, although just limited to certain areas where jeepneys do not usually pass. Only a few taxicabs were then plying the streets, courtesy of G.V. & Sons, Cokin Taxi, La Suerte and some colorums. The trisikads or tricycles were still unheard of, but a few motorcycles were often seen. Traffic then was generally efficient and never seemed congested like what we have today. No hassles, not much sidewalk vendors to speak of, except for some cigarette and newspaper stands very much low-key, since cops would often check on them to free the sidewalks at all times of the day. Everything then seemed moving smoothly while crime on the streets like muggings, bag-slashings or snatchings, even kidnappings and the like were minimal or non-existent, although thieveries and pickpockets were already giving secret service operatives a headache. The ’60s when Negros Bulletin was on its infancy, also marked a transformation in the city’s business and economic growth, with the downtown area showing signs of greater things to come. This prompted local officials at the time to adopt relevant laws and ordinances geared towards ensuring a favorable climate to potential investors by way of expanding the city’s commercial district and providing certain incentives. The expansion fever has resulted to the setting up of the Capitol Shopping Center, paving the way to the opening of several subdivisions and housing sites towards the eastern portion of the city. Bus and jeepney terminals, which used to be situated within the over-crowded areas of downtown Bacolod, were eventually relocated and the business district streamlined, in accordance with a new zoning ordinance. The mode of economic expansion prompted several entrepreneurs to pursue a long-time dream to put up a commercial port near the commercial center of the city to augment the offshore docking facilities of Negros Navigation at the Banago wharf. From then on, Bacolod had been moving ahead by leaps and bounds, so to speak, and Negros Bulletin was there to record such growth in its own humble way. Today, on its 55th anniversary, the Negros Daily Bulletin, which has been coming out daily since 1994, is still doing its share, just as intently. Indeed, we still have a long way to go. But we are willing to do more for our city and province. The desire and the passion are still there for the sake of our people who have seen us through and supported us one way or the other, for the past 55 years. 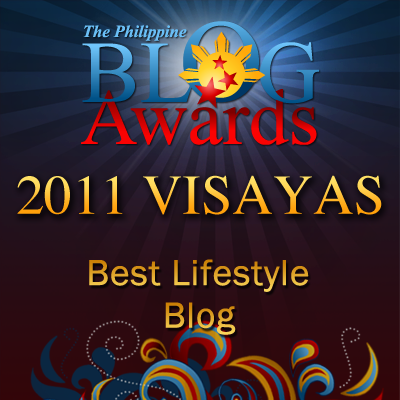 We can only say without fear of contradiction that we grew with Bacolod and we hope to keep it up as time goes by. what a feat NDB has achieved! 55 years in the business takes a lot of hard work! congrats! Congratulations on a successful 55 years, and I wish you and the NDB more amazing years to come! This is quite a milestone for Negros Daily Bulletin and it's nice that you were among the pioneers of the bulletin. Congratulations. First of all, happy 55th year! I always believe that despite the arising technology, newspapers will still another decade. Great on you for being one of the first people that makes up this newspaper. It's a nice achievement to have. It must be fun having your own column where you can share your insights on key issues. This is great. Congratulations, sir! My father is actually from Negros Occidental but I`ve only been to Bacolod city once for a stopover. I hope Negros Daily Bulletin will continue to prosper. wow! that's great! Congratulations to NDB and to you sir! I like your news column title. Keep on vibrating! If only you're in our area, I would love to invite you to speak for our Journalism students seminar. I never thought that you are columnits before. Anyhow, congrats to the entire Negros Daily Bulletin! Keep it up! Congrats sir Gil! You deserve it. 55 years and counting. More power to NDB! Congrats Sir Gil and Happy 55th year to NDB! wow! it is a long-time dream of mine to be a columnist! Congratulations to you sir + to NDB's 55th!